We love excitement and actively search out thrills, but we are cautious and safety conscious while doing so. 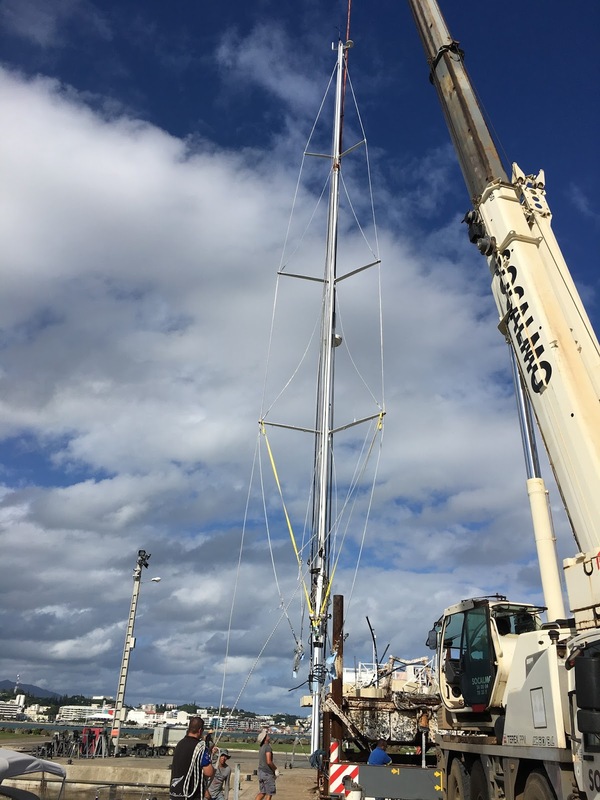 Having sailed 25,000 miles since launching Calliope we consulted experts on whether it was time to change the rigging (all that criss-crossing of wires which holds the mast upright). Opinions varied - some said change at 30,000, others at 40,000, but we reckoned that New Zealand was a good place to get the work done, so had a complete replacement rigging and overhaul, repainted the mast, repainted the boat, serviced everything; in short, a major refit. She looked like new. Second mast climb - we chose this timing! Three days into our passage from New Zealand, bound for Tanna in Vanuatu, 500 nautical miles from New Zealand and 500NM from New Caledonia, Nicky had just come off watch and handed over to Charles at midnight last Thursday. Conditions were a bit inconsistent: we'd had the main well reefed and had been sailing under staysail, but the wind had dropped, so Charles put the staysail away and set a thrice reefed genoa. It was Force 4/5 and 2m seas. Great sailing conditions but squalls around, so sailing conservatively. Suddenly, one of the diagonal bracing wires (the Ds - D1 from deck to first spreader horizontal, D2 from horizontal to next spreader etc) was unattached at its lower end, flailing around, lashing at the mast. It was on the starboard side. Nicky and Fraser came up as Charles furled both sails away and we started to think of a plan. We have spare kit to repair these metal joints but there's no way you could do that with one hand, clinging on to a swaying mast in the dark. For the non-technical, we tightened every halyard and rigged what substitutes we could. The twanging noise of the loose D wires was awful and they were rebounding off our newly-painted mast, certainly causing cosmetic damage and possibly worse. Less than half an hour after the first D failure, its pair on the port side came loose and, with a horrible inevitability, not long after, the pair above. The mast now had no lateral stability and was flexing and bending - it was like when you hold a pencil between thumb and forefinger and wiggle up and down, so that the straight pencil appears to be bendy. Meanwhile, down below, the movement of the mast was causing the ceiling panels around it to buckle. We removed those and could see that the base of the mast was moving about three centimetres each way. We stuffed wedges of foam into the gaps to try to minimise the movement, but they had little effect and, in the process, Charles got two of his fingers crushed - there is no arguing with a one and a half tonne mast. He is lucky not to have lost them. The cut is deep and he will lose one nail, but we have kept it clear of infection with antibiotic cream and he is off washing up duty. He has been swimming with a latex glove taped at the wrist, which keeps his hand completely dry. Back to the drama, which, while it makes a good story in retrospect, was no fun at all at the time. I added extra items to the grab bag and prepared to take to the life raft if we were dismasted, holed and had to abandon ship. Luckily we could be in radio contact with the Oyster fleet immediately. Later we called NZ Maritime Rescue and said that we were under control at the moment but that our situation might deteriorate. They informed New Caledonia rescue, who called us at intervals to check on our progress. This was reassuring but the ocean is a very big and lonely place and it was the Oyster fleet who provided us with the best moral support (and the promise of physical support if needed). Two boats, Venture and Safiya, diverted to come near us. Safiya watched over us and accompanied Calliope for a day heading west, which was not on their course to Vanuatu, handing us over at midnight (what a long 24 hours that had been!) to Unconditional, who were heading for New Caledonia but had to wait for us. Just typing this makes me feel emotional - massive thanks to all of them. Our regular morning and evening SSB radio nets were hugely supportive too - thank goodness the SSB was working well, thanks to Tiny's father in Auckland. So with all rigging jury rigged as best we could, we motored to the south of New Caledonia. We could see dark clouds and squalls ahead and took avoiding action, not wanting to subject the mast to any extra strain. Going straight into or down waves was all right, but any roll and the bending of what should be a straight white line was horrendous. We arrived just after dark at Baie du Prony on Sunday, where there's a huge nickel factory and large ships loading, found a quiet corner of the bay to anchor in and slept like logs. In the morning Nicky swam across to Unconditional and called to them, but they were unwakeable. A couple of hours later, we motored up within the reef to Noumea, the capital. When we berthed, Charles counted the motor hours, seventy nonstop. Well done VW engine! We treated Unconditional's Tom and Sara to dinner that night and they slipped away the following morning. Fraser was a star crew for us. What we came to call "the Fraser line" stabilised the starboard side of the rig. He admits to having a poor head for heights and hadn't been up a mast before, but he clung on even when the boat was swaying through ridiculous angles - he has some impressive bruises to show for it. On a less dramatic note, he also brought us some sourdough culture and made a delicious loaf, which I'm hoping to continue doing. 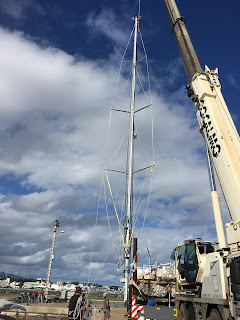 The day after we arrived in Noumea Andy "Tiny" Duff, who had supervised all the work done on the boat, and Nick the rigger arrived and the mast has now been lifted off Calliope for repairs, repainting and assessment of what failed so catastrophically. There are only four possibilities: defective kit, defective workmanship, poor seamanship, or extreme weather. It certainly wasn't the last two. If we waited for the insurers to agree on work to be done, we'd have missed our chance to continue with the other boats on the Rally (they're now in Vanuatu, sending dramatic photos of Mt Yasur volcano in action! ), so we have gone ahead and started repairs, which are likely to take two weeks at least. Pippa our barrister daughter, who specialises in professional negligence, says "res ipsa loquitur", and the insurance will work itself out. So here we are in New Caledonia, which we always wanted to visit, in part to see where our son Alex spent several months about ten years ago, teaching English in Canala on the east coast. We checked into the gorgeous Sheraton resort near Bourail and Nicky had a suitably delicious birthday dinner (she'd sneaked in a birthday swim in Anse Vata in the morning and felt very loved by friends and family around the world from watching the video Mike put together. Thank you!). We will have plenty of time to relax and to explore these beautiful islands. There'll be time to do a bit of long-distance wedding planning! Calliope looks odd without a mast but is still a functioning vessel which can take us along the coast. We just hope we can be ready to leave in time to join the other Oysters on the crossing to Mackay in Australia. We'll have two crew with us and pray for less drama on this passage! There are not many photos at the time. Here is Fraser making the second mast climb attempt - these were calm conditions we chose! And my fingers and the mast coming out; the diagonals that came loose are those from the outside into the mast. All 4 unscrewed despite the locking nuts, nothing actually broke. - then we heard noise of the ceiling liners at the mast moving in the saloon. We removed the liners to see the mast moving c3cm either way at that level. Tried to re-stuff the foam in. Substantial movement throughout the rig and bend to the mast, maybe 15cm either way at second spreader? r line to the port side D2 as the bottle screw was not attached to the wire. - at c1300 Friday 27 April rang maritime rescue in New Zealand to tell them we were in a situation, were coping with it and had it stabilised, that other Oyster yachts were on station, and the rally organisers were aware, that we did not require assistance but to let them know it could develop to a point we might need assistance. They noted this and said they would notify New Caledonia Maritime rescue. NC MR called us back Saturday am and we stayed in contact with them until we arrived in Noumea. - while Safiya was on station we attempted a second mast climb to attempt to get a line to the second spreader at about 1630 to stabilise the port side. It had been windy, squally and rough throughout the day as we motored at 4/5 knots west to minimise roll. - we then motored in the company of Unconditional to Noumea, arriving and anchoring in the Baie de Prony on Sunday night, 29 April at 2100, then up to Noumea to arrive Port Moselle at 1500 Monday 30 April. Total distance motored about 450NM over 70 hours. While at times rolly, the rig has felt stable during this trip.